Hey everyone! 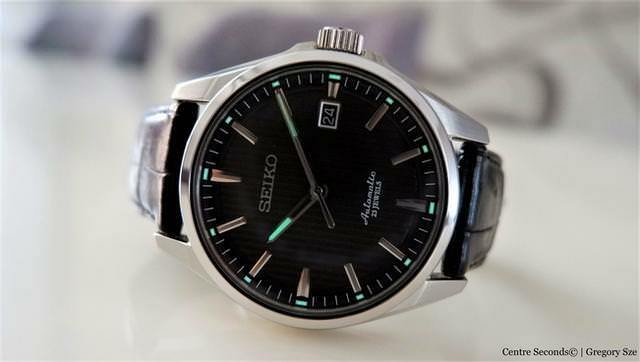 Am relatively new around here (been doing more lurking than posting XD) and would just like share a quick review of one of my all-time favorites, the Seiko Presage SARX017. So without further ado, *clears throat* here's my take on this JDM beauty. Introduced close to a decade ago, the Seiko Presage SARX017 is still a strong contender for the hypothetical one-watch collection. The blend of sporty and dressy aesthetic cues allow it to work with almost any outfit from casual to business executive. Even better, the SARX017 is relatively hard to come by due to the fact that it was only intended for the Japanese market. Coupled to an entry-level price, one will be hard-pressed to find a more all-rounded watch for the money. 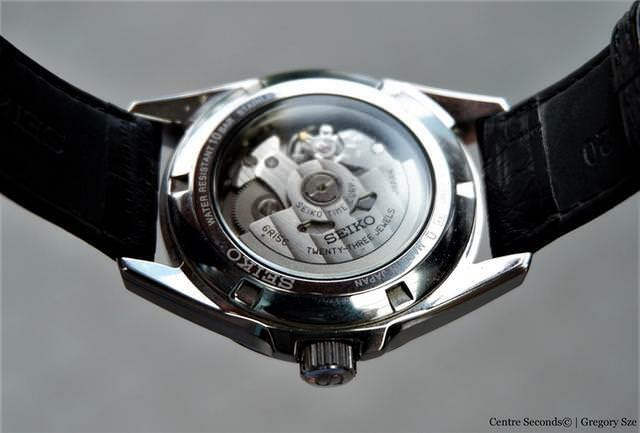 Powering the Seiko Presage SARX017 is the in-house 6R15 calibre with hacking and hand-winding. The movement contains 23 jewels and beats at 3 Hz or 21,600 vph. Power reserve is rated at 50 hours so you can practically take it off on Friday evening and still have a watch that's running come Monday morning. Other technical details of the watch include a case size of 39 mm excluding the crown and a lug to lug measurement of 47.5 mm. 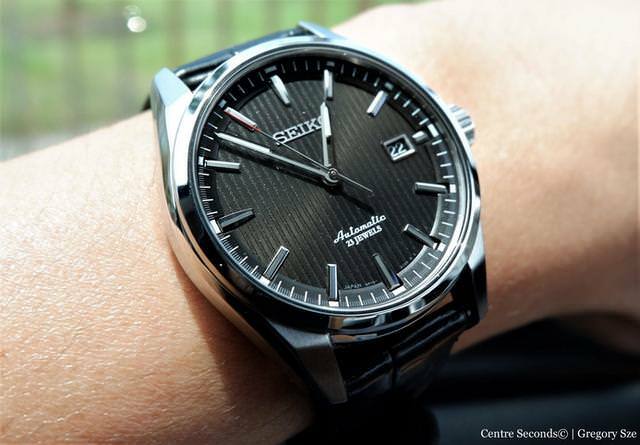 Those with skinnier wrists should find the Seiko Presage SARX017 a good fit. As for the looks of the watch itself, at first glance most would find it a tad sombre. However, look closer and several details being to pop up, providing a nice contrast and a touch of flair to an otherwise conservative-looking watch. For one, the red-tipped seconds hand adds a dash of colour to the dial while the crown guard contributes to a sportier approach. Elsewhere, the vertical stripes on the dial ape the previous Omega Seamaster Aqua Terra models. Finally, the combination of brushed and polished surfaces allow the Seiko Presage SARX017 to perfectly straddle the line between casual and business. 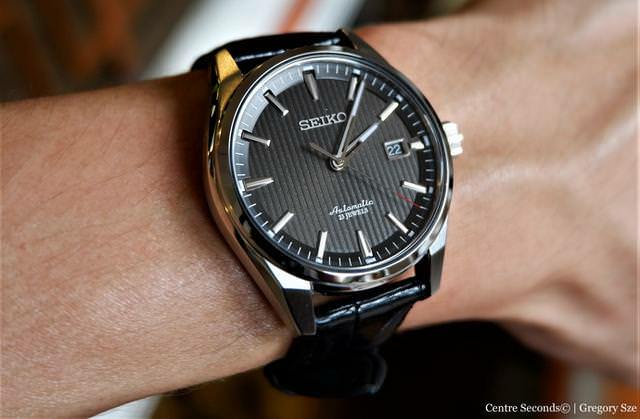 The original black leather strap offered by Seiko is where you can tell the brand had to cut costs in order to make the watch that more affordable. Even with minimal wrist time, the shine of the strap has started to wear off. Furthermore, the strap itself has little to no padding. The only saving grace is the deployant clasp with stamped Seiko wording on the buckle. Operation is fairly easy as you only need to push the two side buttons to unlock the clasp and it clicks back into place with a satisfying, well, click. Now, as I'm still new to the whole posting etiquette, I understand that links to commercial sites are not allowed. This is my personal blog and is NOT a commercial site. Mods, I do NOT sell watches. I do NOT stand to gain financially from attaching this link. If it still violates the guidelines, just let me know and it'll disappear! Cheers everyone! Hope to hear your feedback! Thanks for the review. With its dimension and teak dial, it looks very much like an Aqua Terra. Yeap! An Aqua Terra for those aspiring to own an Aqua Terra! Thanks for the review.. the watch is a beauty..this kind of review is why i hate to lurk around in this site..too much poison.. i need to sell my kidney..any taker?? Nice review. Made me want that watch now. Good job. However, i doubt 50 hour PR is sufficient for you to leave the watch off on Friday 8pm and have the watch continue to tick on Monday morning say 6am. Having said that, most watches don't stop exactly at the PR mark, 50 hour in this case, but the accuracy is typically off after that due to much reduced amplitude. Even that, you might get an extra 5-10% only. Personally I would put it on a winder set for 50% Turns Per Day required for that movement. This way, it will keep working on Monday, without stressing the overwind protection mechanism. But that's just me. Thanks! To those who really want it, you're gonna have to try your luck on the used market. Prices shouldn't be as high as the Alpinist or the original Cocktail but dont take my word for it. Really thinking of acquiring one. THat dial is really mesmerizing. May I ask how thick is the watch? Yeah, the dial was truly the main reason why I couldn't resist getting one for myself. Btw, the thickness is 11.2 mm. And since this watch has been discontinued, if you see one for sale and you really want one, I strongly suggest you pull the trigger! Thanks for your quick reply buddy. 11.2mm is about the limit for a dress watch. Anything thicker would make it a casual watch, not a dressy piece IMO. I'm also eyeing the EPOS 3408, 40mm, 5.9mm ultra thin. Manual wound watch, about the same price as the Presage. No worries. Well, if you're truly gunning for a dress piece, I gotta' say I'd hand it to the Epos. The Presage walks the line closer to a semi-dress/everyday piece, IMHO. Oh, definitely! The striped dial and red-tipped seconds hand was what caught my attention initially. Seiko's finishing more or less always exceeds the price they charge you! Great review! This looks really neat!